Pro-Line Racing Holeshot SC Tires Reviewed « Big Squid RC – RC Car and Truck News, Reviews, Videos, and More! Cubby pulls off two reviews in one week? Some check to see if the Cubs are about to win the world series! Head over to the RC Reviews section to read his latest review! 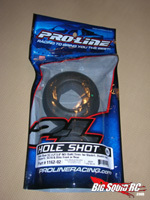 This time he puts the new Pro-Line Racing Holeshot tires to the test! Click the image or here for the review!